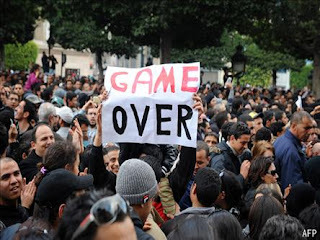 You might have heard about 'Jasmine Revolution' or 'Tunisian Revolution' where citizens fed up the rule of corrupt and uncaring dictators revolted against the dictator Zine el-Abidine Ben Ali, of Tunisia, and overthrew him. He was ruling them for the past 23 years. They changed the rules in their country such that they can continue ruling their country forever. But it was not to be, as the young people fed up of unemployment and no prospects of a better future took the matters in their hands. They had no leader. They organized among themselves with social media tools like Facebook and Twitter and the good old sms. With peaceful protests ( comparatively, though some people died), they were able to change the regime. This news inspired me very much and I was not alone as the neighboring countries like Egypt and Yemen also drew inspiration and decided enough was enough and are protesting against their dictators. Especially in Egypt, the protests are still continuing. It has been six days and about a 100 people have become martyrs, but still the people are hopeful that Hosni Mubarak's 30 year regime is going to end. I really wish they are successful in bringing about change. Both of these news have given me immense hope that the youth of India will revolt against the ever increasing corruption in India. I also wish that we all realize that it is not required that everyone has to go into dire conditions as people in Egypt are in now as we have the opportunity provided by democracy to vote a government out of power every 5 years. Its a pity that there are very few good candidates standing in the elections, but it is never too late to encourage good people into politics by voting and voting correctly, by demanding transparency and an end to corruption.